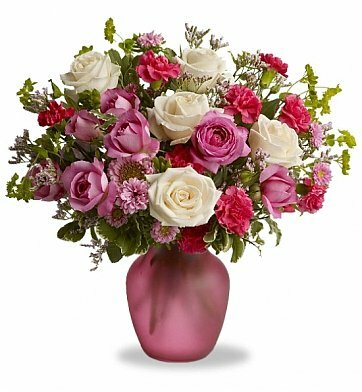 Heads will turn and hearts will flutter when the recipient receives this striking bouquet of flowers. A unique vase holds a generous amount of roses and spray roses, along with miniature carnations and Matsumoto asters. The blooms are accented with limonium and pittosporum for an overall effect that creates a feeling of romance and sophistication. Measures approximately 15" x 16". Ravishing Rose Bouquet is a hand delivered gift. These gifts are delivered by one of our local design centers located throughout the United States and Canada. Same day delivery is available for most gifts when ordered before the cutoff time. The cutoff time for Ravishing Rose Bouquet is 2 PM in the recipient's time zone. The title says it all, my wife loved these. They were delivered to her at work along with chocolates that never made it home. The flowers gave many days of enjoyment to her. Great for an anniversary, lots of color. The arrangement was very beautiful and the flowers lasted a long time. My only complaint was with the delivery. I ordered the bouquet on Thursday at 2:00 pm and I wanted them delivered on Friday. They did not arrive until 4:30 pm on Friday. When I ordered the flower arrangement, for our annyversary, it was including a chocolate box that never came. The arrengement was not bad. This was a very beautiful arrangement with a beautiful vase. The person that I sent it to liked it very much.